To purchase please clinks links to Dos Madres Press or Amazon. In his new collection of poems and narratives, “Reflections in a Smoking Mirror,” Paul Pines writes from the elusive edge of cultures, landscapes, and people during times of change. While conquest and revolution might be considered main themes, a deeper personal thread runs through this assortment of historically based stories, poems, and personal poems. While Pines is writing about very specific places and time periods in Mexico and Belize, poems like “Restaurant Villa Hermosa” and “Punta Gorda” reveal the human condition so powerfully well I sometimes feel like I could be reading about the neighbors next door. In “Restaurant Villa Hermosa” Pines writes the following of La Duena, the cashier: “with the memory/ of loveliness/ she pins back her hair:// she knows that feelings become extinct/ when we cease to use them// how we change as creatures/ once they are gone.” In these lines Pines captures that “elusive edge” couched in a simple tip of the hat towards growing old. In another poem “Punta Gorda,” Pines writes “Now a new generation has sprung/ from Cat Landing// to find/ a way out//or discover/there’s no escape/ from a place.” A succinct stab at humanity’s teenage years? Pretty much a direct hit. Overall, this is a collection worth returning to. Perhaps it is because I keep finding new layers of meaning couched between lines. Maybe it is because poems like “Restaurant Villa Hermosa,” “Vectors,” “Reflections in a Smoking Mirror,” and “Birds of Belize II” grab hold of me and don’t let me go. But mostly, I keep returning to “Reflections in a Smoking Mirror” because I just enjoy the way Pines writes. Paul Pines' new collection, Reflections in a Smoking Mirror, includes both poems and short narratives that weave their way through various eras and landscapes, notably fixing its gaze on moments of transformation, capturing the tangled energy these upheavals bring. Pines' focus is on the various countries of Latin America, cultures whose character have been shaped by its many conquests and revolutions. A lyric poet, the various historical ruminations are filtered through Pines' unique perspective and careful, articulate voice. This lends the poems a distinctiveness as well as an air of familiarity, for while Pines writes knowledgeably and insightfully about these vastly different cultures, he manages to lend them a universality that allows the reader of any background the shock of recognition and the experience of what it must felt like to be among these people at such times of crisis. Pines' presentation of the material is definitely non-linear, and follows a pattern of thinking that remains somewhat intuitive; poems lead into one another based more on an emotional content than on strict theme. It is obvious Pines has given the structuring of the book great care. I am reminded of Paul Blackburn's careful structuring of his works, most notably The Journal poems where the poems are both individual works, unique in content, but also discrete parts of a whole that is greater than the sum of its parts. The poems jump around not only in space but in time—a poem taking place outside of time, in the speaker's consciousness, can be followed by a poem taking place in something like the present, while the following poem traces events taking place decades before. Rather than causing confusion, this unseating of linear time—a "crazy quilt" as Pines describes it in his introduction—underlines what I believe to be Pines' larger implication: that all places and all times, both personal and historical, are subject to such upheavals, and our survival is always threatened, always uncertain. 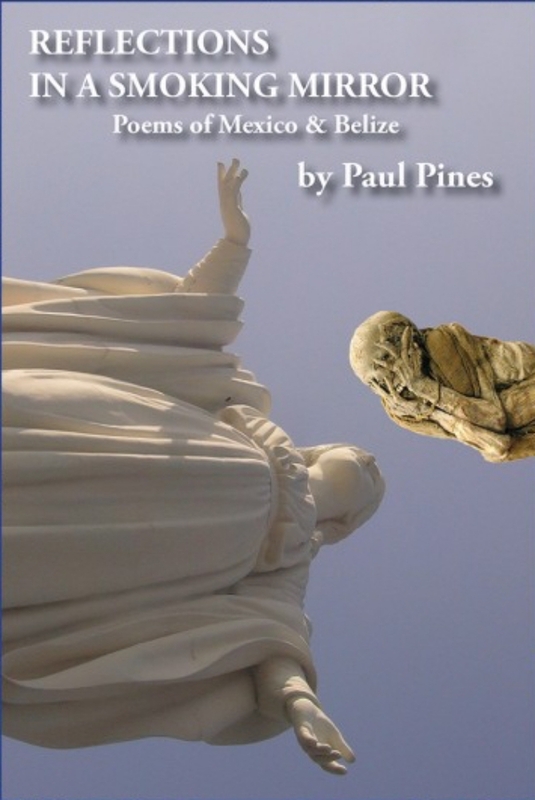 What ties these poems together is Pines' distinctive voice and the omnipresent guide of his demanding and imposing perspective. Pines makes the past his own and with each subsequent line owns whatever time is spent savoring his poems. And there is much to savor. Among the most notable poems is "Restaurant Villa Hermosa" in which Pines observes the stark beauty and distinct elegance of a simple woman working as a cashier in a restaurant: "with the memory/ of loveliness/ she pins back her hair:// she knows that feelings become extinct/ when we cease to use them// how we change as creatures/ once they are gone." nothing accounts for . . . The veil has started to lift. The second section, "Synchronicity," features a polyphony of distinct voices from the ancient past. Pines only came to a recognition of these voices after having completed a journey started in Mexico City in 1962 when he first encountered the work of a descendent of one of the first Conquistadors, Nakuk Pech, whose name, Pines claims, sounded vaguely like his own. 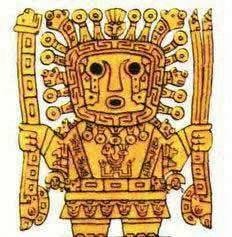 Pech later collaborated with the Spanish invaders and it is through his eyes that we see in unflinching detail the massive devestation the conquerers wrought, the unforgiving blindness of power and the sick indifference of the world or of the Gods to the natives' plight. Pech is an unblinking witness of these violent and catastrophic events, and he "place[s] them here like heart beats," writes Pines. Pines' book includes helpful notes on the poems as well as a "partial" glossary; a welcome gesture of accessibility in this otherwise profound, and profoundly enlightening work. 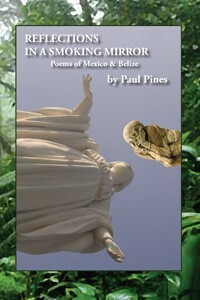 Paul Pines' newest book, Reflections in a Smoking Mirror: Poems of Mexico & Belize, arrived at a time when I was bombarded with work and so I put it aside to read when I got the chance. Its true impact didn't manifest, however, until after I'd read the book in its entirety - and then gone back and read it again. The power of words on a page, to tease or repel--or to invite to return for a deeper look. The words drew me back, whispering there's more to this than one might imagine. I'd only very recently discovered the work of Paul Pines and found that certain of his poems instantly resonated with me. His latest publication, Reflections in a Smoking Mirror, especially piqued my interest. This book appealed to me on two levels: one was its creative (almost experimental) format, i.e., you're reading a group of reflective poems about myth and conquest and journeys retraced; thenmid-book find yourself gently speed-bumped back in time. The poet-voyager with whom you've been traveling recedes into the background and another, centuries' older voice emerges. Presented with the translation of an ancient manuscript, you pause to examine its contents -- suddenly you're living a piece of history. Then blip! - you're takenback to the 21st century to rejoin the poet in Belize, with poems that accentuate the mesh of change and continuity. New meanings emerge, the fog clears ... you begin to really see. Its second appeal was the insight it imparted. Merely stating that the book proved "insightful" doesn't do justice to the unexpected expansion of consciousness that results from reflecting on these parallel journeys--the poet's as narrator/ one's own as reader, "mirroring". The poems themselves become the vehicle that awakens (or enlarges) this consciousness. Granted, I'm relating a very personal, subjective response here, but I am not alone in noting that this book contains more than just--as its title suggests--a compilation of poetry and reflections. The story of how this book came about is itself quite interesting. Imagine you're wandering by a bookstall in Mexico City in 1962 and happen upon a copy of an account by a sixteenth-century cacique (provincial governor) whosename translated into English sounds like your own - and five years later you inadvertently find yourself in what's left of his "once proud city, now just a few huts, reading his words" and that because of these seeming coincidences you embark on a decades' long journey that will open worlds of perception you never thought possible. 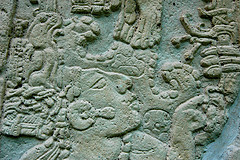 Gucumatz, the Quiché Maya serpent god. In Section Two: "Synchronicity," Pines lets the ancestors themselves speak. It is only at the end of his journey, he writes in the preface, that their voices have reached him "in ways that have not always been apparent, except for the blood-smoke on these pages." Through Pines' translation we get to meet his alter-ego, Nakuk Pech (baptismal name, "Pablo") , descendant of the first Conquistadors of Maxtunil, as Pech relates how they--he and his father--joined forces with the Spanish conquerors. A conquest by conversion, in Pablo's case; he watches the power of power, to subjugate, render powerless. We went drunk on 'pinole' because everything seemed bitter and they ordered us about like masters of the earth. For six months they rode and we followed on foot. Many witnessed these events. I am writing down for my children and those to come until death takes this land for its own. Until then ... I do not pay tribute--nor will my sons and daughters. Pech records the events as they happened. "I place them here like heart beats," he says. Just as Pablo Pech invites readers centuries later to understand what it was like to share his particular experience, so his contemporary alter-ego, author/poet Paul Pines, invites readers to join his journey of discovery and share his reflections connecting the past and the present, what has been preserved and what forgotten. In the third and final section of the book, we are back in the 21st century again, this time in Belize, continuing our voyage along with Pines, in amirror travel where "half-way down the coast/ the Coxscomb Mts bleed into the sea". In sum, I found this book unexpectedly compelling, because it goes beyond consideration of what's remembered/what's lost -- itgets you thinking about the depth of human resilience and spirit, and survival of myth in amodern world "driven by time, instead of depth". The author himself best describes, far better than I could, what readers slowly become aware of throughout: images taking shape in the mind, "as in a polished obsidian mirror--smokey at first, then clear." [p. 49]. A book worth reading - and then going back and reading again.